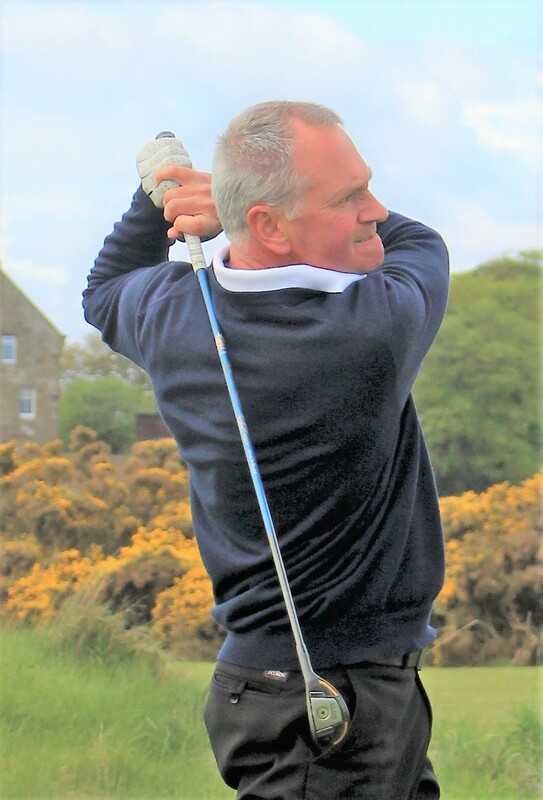 Nairn's Robert Smith and Duncan Hamilton (Mortonhall) share the lead at the halfway stage of the East of Scotland Senior Open. They were the only players in the field of 132 over-55s to post sub-par scores of one-under 71 over the Fairmont St Andrews Torrance Course. Hamilton had birdies at two par-5s, the third and the sixth, in an outward 35 but he dropped shots at the short eighth and 10th before getting back on track with his third and final birdie at the 14th. With 18 holes to go, they lead by one from Stewart Henderson (Hamilton) and William Erskine (Kilsyth Lennox). Erskine would have been the leader on his own but for running up a double bogey 5 at the short fifth. He did birdie the sixth, seventh, ninth and 15th. Erskine, in fact, had the lowest net score of the day - a 69 off his handicap of three. There were 119 scores returned, six No Returns, and seven players retired during their rounds. 73 K Bruce (Edzell), John Johnston (Lanark), K Reilly (Silverknowes), S McKendrick (Dunkeld and Birnam), M Lindsay (Broughty), R Clark (Erskine), J Archibald (Luffness New), N Robson (Meldrum House). 75 G Grimmer (Nigg Bay), A Belford (Prestwick St Nicholas), C Wilson (Ladybank). 76 R Craw (Glenbervie), R Jenkins (Royal Troon). 77 I Stewart (Glenbervie), I Smith (Gullane), N Dyce (Strathmore), D Low (Gullane), J A Fraser (Royal Burgess), L Chancellor (Inverness), K Renton (Lundin), I Graham (Lochmaben). 78 D Hart jun (Downfield), S Finnie (Caledonian), K McArthur (St Andrews), B Bingham (Royal Troon), K Thomson (Bramall Park), D Waddell (Glasgow), R Johnston (Glenbervie), D Imrie (Turnhouse), K McAllister (South Shields_. 80 G Bell (Downfield), P Brewer (Drumoig), N Lamond (Tantallon), I Christie (Mortonhall), I Jeen (St Andrews New), D Shields (Glenearn), J Gullen (Tillicoultry), G MacDonald (Glenbervie), L Pirie (Millport), G J Rodaks (Pitreavie), G Curran (Mortonhall), G Sharp (Dumfries and Co), J Watt (Edzell), P Hardwick (Newbattle). 81 G McNab (Lundin), A K Helm (Merchants of Edinburgh), B Reid (Dunbar), T Sirel (Largs), I Dickson (Lundin), I Morrison (Royal Aberdeen). 82 D A Hunter (Southerness), K Cooper (Canada), D Walker (Lanark). 84 D Downie (Clober), T Anderson (Downfield), P B Kinloch (Cardross), R Lumsden (Edzell), J Russell (Goose Creek). 85 F McLennan (Royal Aberdeen), I Fraser (Dumfries and Co), A J Smith (Duff House Royal), S Drysdale (Leven GS), D Lindsay (Kilmarnock Barassie_. 86 S Rowell (North Berwick), D Ireland (Craigie Hill), J S Macdonald (Dunfermline), L Taylor (Kirriemuir). 87 D McQuade (Glenbervie), N Whitehead (Kemnay), D Wilson (St Andrews New), D MacDougall (Royal Dornoch), E Robertson (Stirling). 88 A T Campbell (Murcar Links), D A Taylor (St Andrews New), N McGarva (Kilmacolm), D J Smith (Stirling), R Scott (Downfield0. 89 G Cochran (Irvine Ravenspark), I I Gourlay (Strathaven), K Ross (Glasgow), A Hogg (Stirling), R Farquhar (Carnoustie). 90 A Raphael (St Andrews), D Nelson (Aboyne). 91 R Gray (Rowallan Castle), D Scott (Royal Troon), I S Kerr (Kilmacolm). 92 G Smith (Royal Troon), R Macpherson (Tantallon).